Hands down, the Apex has the most feature-rich, field tested software of any controller on the market today. It all starts with the onboard web server inside the Apex Base Unit. This web server is part of the Apex’s firmware and is truly the secret sauce to its success. Not tech savvy, no worries Built-in wizards allow even the most technophobic person out there to be able to program the basics like light timers and heater control in a matter of minutes. Then, as you build up confidence and engage the awesome Apex Community Forum, you will be taking it to the next level in no time. The Apex Base Unit is basically the brains of your entire Apex System. The Apex Base Unit (ABU) is far different than from what any other controller at this price level is offering. The ABU is basically a small computer whose only job is take care of your aquarium. It has a 32-bit microprocessor and a built-in web server. The web server makes it possible for you to configure and operate your Apex from any network-connected computer or mobile device – no software to install on a PC – it also means it’s Mac compatible! And, with Internet Connectivity, the Apex can be configured so that you will get an email or text message whenever something is not quite right with your system – whether that is an over-temperature condition in your tank, the pH is out of whack, or there’s a leak on the floor (*Advanced Leak Detection Module and sensor required)! Graphs, Graphs, Graphs! The Apex has a full-featured graphing engine built right in. As an example, you can very easily compare the cycles of your outlets with temperature and pH, identify ongoing patterns of trouble, and even discover ways to cut costs like being able to visually see when two external devices (such as a heater and a chiller) are on simultaneously when they really shouldn’t be. Going Mobile? The Apex did! The Apex is the only controller on the market that has manufacturer-written, full-featured applications for the computer browser (Mac or PC), iPhone, iPad, and Android phones and tablets (currently available as a beta). Now you can take your Apex with you anywhere and check in on your tank, reprogram your lights, or even feed your fish remotely from the touch of your phone! 6 – I/O switch inputs (for use with door switches, feed buttons, ATO, etc. )*Break-Out Box Required. This is a topic other controller companies like to avoid. Why? Because not all monitoring ports are created equal. Galvanic Isolation is key to getting accurate readings on pH, Temp, ORP, and Conductivity. Some controllers either do not do it well or possibly not at all. Now of course that is all geek-speak to most of us so let’s just put it this way: on a controller without galvanic isolation, your readings of pH, Temperature, ReDox (ORP), Conductivity/Salinity, etc. will be inaccurate. The Apex Base Unit comes standard with four channels of 0-10V control. These outputs are controlled in the Apex software and are most commonly used for LED dimming or Tunze speed control pumps. By using one of Neptune’s optionally available cables, you can connect any Apex Ready 0-10V device to these ports. This means you can do cool things like have your LED lights ramp up and down to simulate sunrise and sunset! The Energy Bars available for the Apex systems are much more than a glorified power strip. In fact, this component of your aquarium controller equipment is far more important than most people realize – and not all systems are created equal! Neptune Systems has put a lot of thought into the construction of the Energy Bars. Unlike other competitor’s and simple power strips, Apex Energy Bars are made out of 16 gauge, powder-coated aluminum. They are built to be bullet proof – almost literally! Each of the independently controlled outlets on the Energy Bar is independently switched and easily carry the current load specified on the label. In fact, Neptune Systems intentional underrate the outlets just to provide that extra level of security. So, depending on which Energy Bar you purchase, each outlet is rated from 5A to 10A at 120V AC. One additional advanced feature is that when you use an additional Energy Bar on a UPS (uninterruptible power supply) you can have key lifesaving devices (low-power powerheads and bubblers) on there that will automatically go into their Failsafe State once power failure is detected. This can keep your tank alive and healthy for hours on a good UPS until the power comes back online. This will run completely unattended and is ideal to give you peace of mind when you are away from home whether out for the evening or on a two-week cruise! Apex Display Module uses high-quality, mechanical buttons. So what you say? Well many devices out there make use of what are called capacitive touch pads. This type of membrane button is just fine for your toaster oven, but in a saltwater environment it is highly susceptible to failure. So, even though the cost to us was higher, we went with mechanical buttons for our Display Module ensuring your product a much longer life. Neptune Systems believe the most important thing for the customers is ease in readability and size of the display. What good is a color display if it is barely larger than a postage stamp. That is why they went with the backlit graphical display. It was the perfect match of function and value for the customers. This controller is the best thing you can purchase for your aquarium. 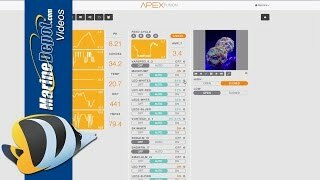 You can monitor and make changes anywhere through apex fusion. It is so easy to run heaters, chillers, pumps. Makes my water changes easier running through my iphone. Expensive, but worth it. The item description speaks for itself. I don't know how I did without this product when I started my saltwater tank years ago. The product is everything as advertised and more. There is about nothing that this cant do or tell you about! The only problem is setting up the email and internet access and programming pump settings etc.. If you can get thru that you are all set. That is the reason I took a star off.